← Congratulations Week 10-28-13 Giveaway Winner! I‘ve been writing, in one form or another, for over forty years. I’ve written a number of screenplays, many of which I’ve produced and directed myself. The Ambitious Card is only my second attempt at novel writing. I made a lot of short films in junior and senior high. I learned very early on that you need a script when you’re making a movie. Since no one was stepping forward to give me scripts, I ended up writing the scripts myself. And I’ve been doing that every since. I’ve sold some of the scripts (most notably to the European TV series, Lucky Luke, starring Terence Hill); many of the rest I’ve shot myself. I am drawn to comedies, so everything I’ve written as some comic element to it. The Ambitious Card has a lot of humor in it, in addition to a pretty good mystery. There’s supposed to be a favorite part? Just kidding. Coming up with the ideas is always the best part – an idea for a character, a scene, a twist. It never happens the same way twice. With The Ambitious Card, it was the title. An ambitious card routine is one where a card keeps appearing and disappearing. The story grew out of that. In other instances, the story has grown out of a location … or a random line that someone says … or an idea for a closing scene. You never know where the idea will come from. The Ambitious Card looks at the life of a working magician when he is implicated in a murder. It’s a fun look at the sub-culture of magicians – it’s something that people find interesting and that isn’t all that common. Plus he runs into a lot of interesting characters and there’s a lot of humor in the story. It all adds up to a fun mix. I don’t have as much time as I’d like to read; however, I listen to books on CD while driving. My favorite genre is mysteries; Lawrence Block is probably my favorite mystery author. Elmore Leonard and Jeffrey Deaver are wonderful as well. I try to keep up with Stephen King, but he writes them faster than I can listen to them! The next book is the second in the Eli Marks series. It’s called The Bullet Catch. I suspect it will be out in late 2014. BE SURE TO COME BACK to read more about John and his novel, THE AMBITIOUS CARD, on Wednesday’s Karen’s Killer Book Bench!! Happy Reading! **SPECIAL ANNOUNCEMENT: John will give away one copy of his novel, THE AMBITIOUS CARD, to one of his lucky readers who comments on his Monday Interview or Wednesday Book Bench blogs!! 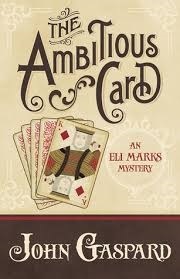 Don’t miss this chance to read an Eli Marks Mystery!! Thanks, John, for sharing your stories with us! I think your book would be fun to read and report on at my Mystery Book Club. We read different authors and sometimes choose books related to a theme, like a comedic theme. Interesting interview. Karen, thanks for featuring John on your blog. His book sounds interesting. I’ll come back for the Wed. blog.